SoCal Parrot is hosting a community forum for the Ocean Beach area regarding local wild parrots and the recent killings of those parrots. The forum will be in the Community Room of the OB Rec Center, Monday, April 11th from 6 to 8 pm. The OB Rec Center is located at 4726 Santa Monica Avenue. SoCal Parrot will give a 30 to 45 minute presentation, followed by an open question and answer session. Also being presented will be an outline of ways that everyone member of the public can help deter those unnecessary acts of animal cruelty in the future. 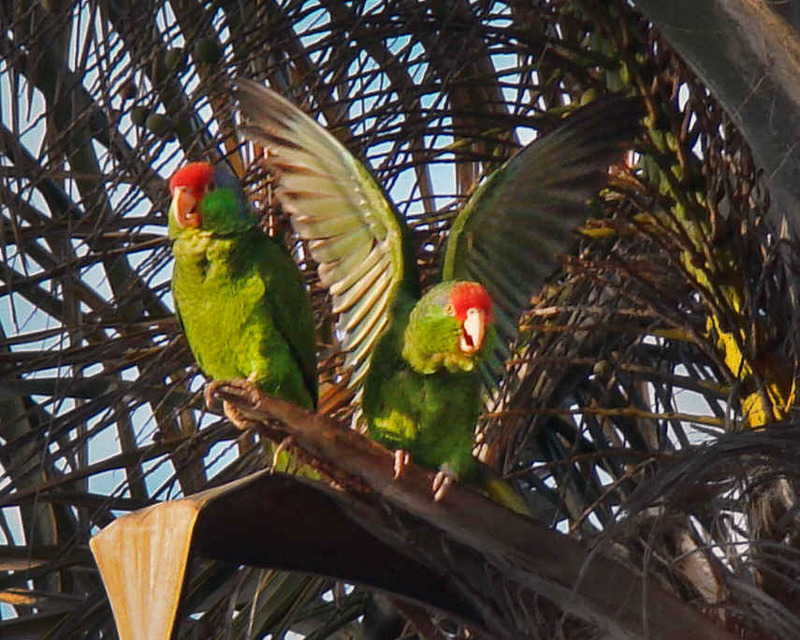 Community members who wish to serve as ambassadors for the wild parrots have the option of joining OB / Pt Loma’s SoCal Parrot Street Team and receive training and support, plus up-to-date information regarding naturalized wild parrot flocks. Ambassadors will have the ability to speak knowledgeably to friends and neighbors about these parrots. I am not supporting the senseless killings of these birds, but they are not native to SD or the area. This is technically an invasive species. That being said, they should be eradicated, like say other invasive species be plant or animal. Why do they get a pass? Because they are pretty? Because the singular fact of being an invasive species is not the technical measure that promotes a government eradication program, I think. Rather, high level negative impact on native ecology is, I think. Like pythons in the Everglades, an invasive apex predator with high reproduction strongly impacting native species. That said, I’m not judging the value of the Everglades python program, only that deleterious effect on native species is likely a key measure, among others. The palm trees aren’t native either. Came in on a boat. Damn things are everywhere now. Henry. You are as sensitive as a box of rocks. Apparently you both missed the point. Invasive species are plants, animals, or pathogens that are non-native (or alien) to the ecosystem under consideration and whose introduction causes or is likely to cause harm. I never advocated their extermination, just saying these birds don’t belong and why do they get a pass? So about that box of rocks? Genius, Varmint. Hi Henry. The word was meant to be “sensible”, not “sensitive”. I need some evidence that the “invasive” parrots are damaging any aspect of our ecosystem, before I change my mind, at which point I might. At his point, I stand by it. Oh, and btw, almost all plants in any beach area in CA are introduced, not indigenous. Henry – you said about the parrots: “they should be eradicated” because they are a “non-native” species. You’re right, I did. So if the pythons in Florida were cute and cuddly, should they be allowed to live free and in the wild? What makes one non-native species ok and another is not? They both are causing harm to the ecosystem, one is not as damaging as the other. There shouldn’t be a distinction, they don’t belong. Under the pretense that they are non-native then yes, they should be eradicated. Is it ok to just go randomly killing animals, no. My husband & I love the Wild Parrott(s) of Ocean Beach. They wake us up, too. But we love them and so do our grandchildren & everyone we know. They come at dawn & sunset. We have watched the little flock dwindle these several days. Today there was only one. I cry tears of rage against the person who has perpetrated this slaughter. I can’t believe he has not been stopped! I say if you don’t like the parrots, move away! Stop killing them! Communites all up the west coast including San Francisco & Seattle appreciate & celebrate their wild parrotts. I think OB should have a Wild Parrott Day & turn out & support the beauty & spirit of these creatures. As far as invasive species go, might as well rip up all the grass, cut down most of the shrubs & trees, & rip out the plants & flowers, too! WE are the invasive species at the top of the list. Now that the land is changed forever, let’s just give it back to the Indians! @Henry – I guess you should kill yourself or go back to Africa then, kook. Wow that’s amazing, just because you don’t agree I should kill myself? Sweet. The Torrey Pine is native. My comment was meant to be sarcastic about the cutting them all down, but I have actually heard that they are not native and were brought here from Australia ~100 years ago when Madame Tingley and the other theosophist came here. Newer Article: Housed to Homeless in San Diego: Could It Happen to You?